January in Teton Valley is cold, snowy … and dark. During this time of year, it’s easy to stay at home, snuggled up next to a fire with a cup of cocoa and a good book. And there’s nothing wrong with that picture, but it can be isolating. To help combat cabin fever, eight years ago, a group of locals decided that the valley needed some sort of party to celebrate winter. Enter the Great Snow Festival. In its infancy, celebrations included things like skijoring, Nordic ski races, ice skating, and dogsled races. 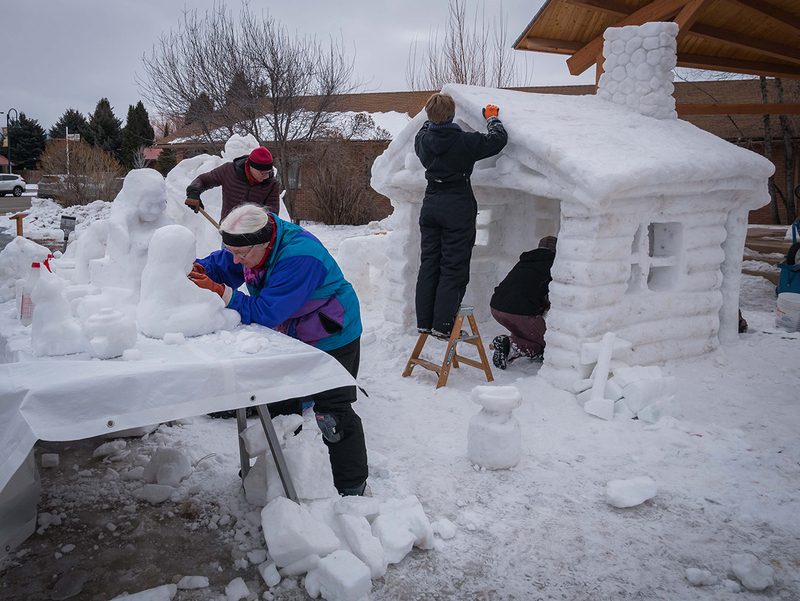 Over time, the festival has been pared down to its essence: the ever-popular snow sculpting competition now known as the Driggs Snowscapes Festival. Needless to say, those “snowmen” turned out to be much, much more. Now every January, thousands of people leave the warmth of their homes to head down to the City Center Plaza, drawn by the magic taking place as teams transform 8-by-8-by-8-foot blocks of snow into Medusa’s head, a bucking bronco, Alice in Wonderland, a Buddha statue, a coral reef with fish … the variations are endless, limited only by the carvers’ imagination, skill, and, of course, the weather. Tilt’s enthusiasm for the festival goes beyond carving. He helps organize volunteers and creates unique handmade tools, designed specifically for snow, to carve and manipulate shapes. He also enjoys interacting with the kids who come to watch him work. Mossman describes how a team will stand around its block for a long time until someone finally “sees” the design in the snow. 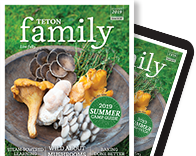 Then they divvy up the tasks and set to work, spending as much as ten hours a day over a five-day week working outside in the snow, cold, wind, sleet, and sometimes, to the consternation of all snow lovers, sun or rain. Carving a giant sculpture out of snow requires hard physical labor with no protection from the elements. Teams spend as much as 50 hours digging, carving, shoveling, smoothing, repairing, and working, all for a product that begins to melt as soon as the final touch has been put in place. For many of the artists, the ephemeral nature of snow sculpting is part of its appeal. They are free to take risks and experiment. They work as a team rather than alone. And they create something on a scale most avoid, if for no other reason than it’s hard to store or sell any huge sculpture they might make out of a more permanent medium. “You have an opportunity to make something really big, and it doesn’t last,” says Mossman. “It’s awesome. And if you don’t like it, it melts! Mossman’s team came back that day and created an entirely new piece called “The Last Iceberg,” which depicted animals threatened by climate change—an appropriate message after experiencing a warming event that destroyed their original sculpture. 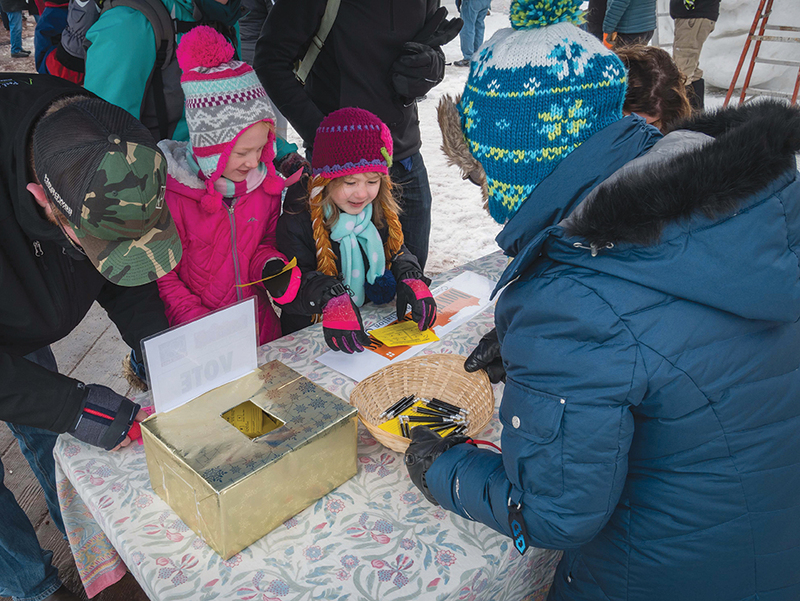 In describing the Great Snowscapes Festival, participants use words like “fun,” “community,” “beauty,” “magic,” “challenge,” “imagination,” “teamwork” and “creativity.” No one talks much about the dark and cold. And if they do, it’s to say those elements only add to what makes the event so special. To join a team or to volunteer, contact Alison Brush at driggssnowscapes.org. 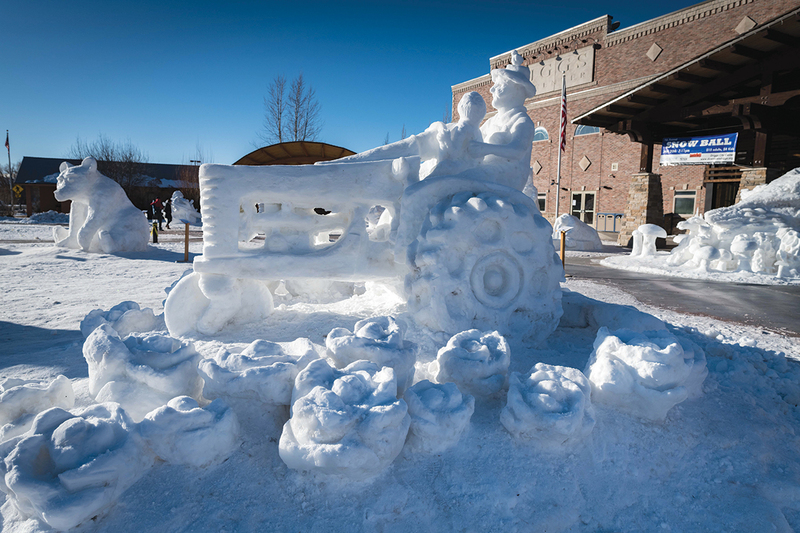 Or get in on the snow sculpting action on the Wyoming side at the Jackson Hole Chamber’s WinterFest: jacksonholechamber.com. And that village includes a lot more people than just the artists who carve the sculptures. Volunteers from MD Nursery begin harvesting and transporting snow to the City Center days before the event. Not just any snow will work—grass and gravel can create cavities in the blocks—so it takes skill to collect the good, pure stuff. Mother Nature helps, too, but some years finding workable snow can be a challenge. The festival uses approximately 5,000 cubic feet of compressed snow. While snow is being harvested and collected in piles in the City Center parking lot, Driggs Public Works plows the plaza, and Jeremy Kincaid and a crew from JK Concrete build the forms for the snow blocks. Once the forms are completed, a team of volunteers gets behind the wheel of a front-end loader and begins dumping the snow inside. Loose snow doesn’t make good carving, so you need a snow-stomping party, naturally, to get the job done. (This year’s will be held on January 11.) Volunteers climb 8-foot ladders and jump down inside the forms to compact the snow. The more people involved, the merrier the event and the faster things go, so volunteers are eagerly welcomed to join the fun. Finally, once all ten blocks are full to the brim, they are left to sit and harden for two days until it’s time to carve. Volunteers also host out-of-town carvers in their homes, businesses sponsor teams, local artists serve as judges and create handmade prizes, and people donate food and take turns manning the hospitality station. Teton Valley kids vote for their favorite “Kids Choice” sculpture.